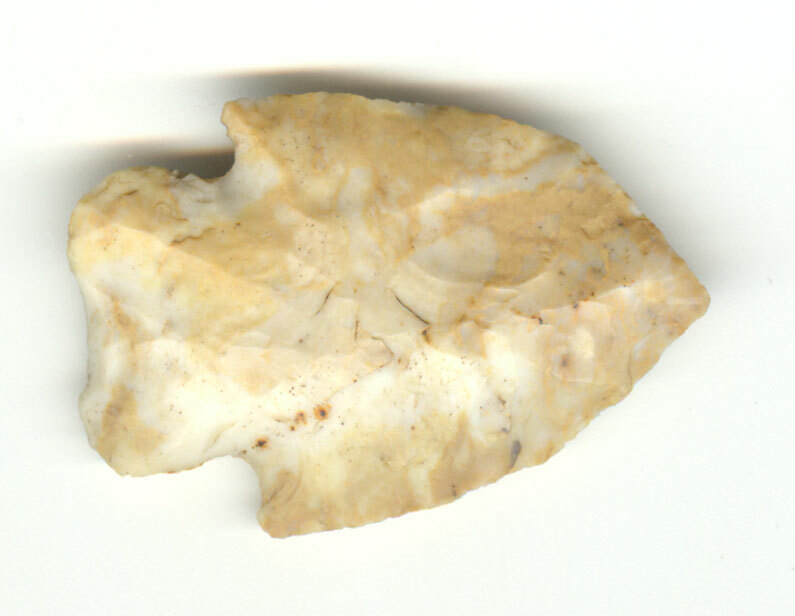 A Normal Size, Colorful, Typically And Well Made, Overall Aged And Visibly Anciently Used Big Creek Point That Exhibits Stone Coloration Aging And Surface Patination, Correct Style Blade Flaking, Visible Aged Sharpened Tip Impact Fracture. Correct Blade Sharpening Use Reduction, Aged Mineral Deposits, Correct Material And Manufacture For The Area Found. Ex-Lonnie Hartline Collection. The Type Was Named By Dan F. Morse For Examples Found Along Big Creek In North East Arkansas. The Drooping Tangs, Wide Bulbous Shape Base, Sharp Tip And Location Of Find Determines The Type Of Point! Includes A Ken Partain Certificate Of Authenticity.